^ Mühe's older brother Andreas took over the family's furrier business: Biography for Ulrich Mühe. Internet Movie Database (IMDb). [2007-08-05]. （原始内容存档于2007-05-22）. However, according to an obituary in The Independent published on 26 July 2007, Mühe's father was a tanner: see Ulrich Mühe : Star of 'The Lives of Others' (obituary). London: The Independent. 2007-07-26 [2010-05-26]. （原始内容存档于2007-11-04）. ^ In 2007, shortly before his death, Mühe was conferred honorary citizenship of Grimma: Biography for Ulrich Mühe. Internet Movie Database (IMDb). [2007-08-05]. （原始内容存档于2007-05-22）. ^ 3.0 3.1 3.2 Ulrich Mühe (obituary). London: The Daily Telegraph. 2007-07-27 [2010-05-26]. 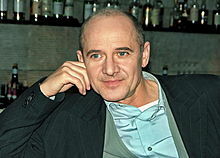 ^ 'The Lives of Others' Actor Ulrich Mühe Dies. Deutsche Welle. 2007-07-25. ^ Paterson, Tony. Ulrich Mühe, Star of 'Lives of Others', Dies Aged 54. London: The Independent. 2007-07-26. （原始内容存档于2007-09-30）. ^ For instance, Florian Henckel von Donnersmarck, the director of Das Leben der Anderen, expressed the view that the original cause of Mühe's stomach problems that eventually led to cancer was the anxiety he suffered when he was a conscript in the East German military: Bergan, Ronald. Ulrich Mühe (obituary). London: The Guardian. 2007-07-28. ^ Bergan, Ronald. Ulrich Mühe (obituary). London: The Guardian. 2007-07-28. ^ Biography for Ulrich Mühe. Internet Movie Database (IMDb). [2007-11-23]. （原始内容存档于2007-05-22）. See Jeanne Gröllmann 在互聯網電影數據庫（IMDb）上的資料（英文） Retrieved on 23 November 2007. ^ Oscar Film's German Star Dies. CNN. 2007-07-25. ^ 10.0 10.1 Awards for Ulrich Mühe. Internet Movie Database (IMDb). [2007-08-06]. Plass, Sarah. Ulrich Mühe, Film and Stage Actor, Dies at 54. The New York Times (Late Edition). 2007-07-25: 7. Danielsen, Shane. Ulrich Mühe 1953-2007 : The Actor who Played the Conscience-Stricken Stasi in The Lives of Others has Died. London: The Guardian. 2007-07-25 [2010-05-26]. Paterson, Tony. Ulrich Mühe, Star of 'Lives of Others', Dies Aged 54. London: The Independent. 2007-07-26. （原始内容存档于2007-09-30）. Ulrich Mühe : Star of 'The Lives of Others' (obituary). London: The Independent. 2007-07-26 [2010-05-26]. （原始内容存档于2007-11-04）. Ulrich Mühe (obituary). London: The Daily Telegraph. 2007-07-27 [2010-05-26]. Bergan, Ronald. Ulrich Mühe (obituary). London: The Guardian. 2007-07-28. Ulrich Mühe : German Actor who Won Acclaim Playing a Stasi Officer in the Oscar-winning The Lives of Others (obituary). London: The Times. 2007-07-28 [2010-05-26].